The brown rat, common rat, sewer rat, Hanover rat, Norway rat, Brown Norway rat, Norwegian rat, or wharf rat (Rattus norvegicus) is one of the best known and most common rats. One of the largest muroids, it is a brown or grey rodent with a body up to 25 cm (10 in) long, and a similar tail length; the male weighs on average 350 g (12 oz) and the female 250 g (9 oz). Thought to have originated in northern China, this rodent has now spread to all continents, except Antarctica, and is the dominant rat in Europe and much of North America—making it the most successful mammal on the planet after humans. Norway rats have acute hearing, are sensitive to ultrasound, and possess a very highly developed olfactory sense. Their average heart rate is 300 to 400 beats per minute, with a respiratory rate of around 100 per minute. The vision of a pigmented rat is poor, around 20/600, while a non-pigmented (albino) with no melanin in its eyes has both around 20/1200 vision and a terrible scattering of light within its vision. Brown rats are dichromates who perceive colours rather like a human with red-green colorblindness, and their colour saturation may be quite faint. Their blue perception, however, also has UV perceptors, allowing them to see ultraviolet lights that some species cannot. 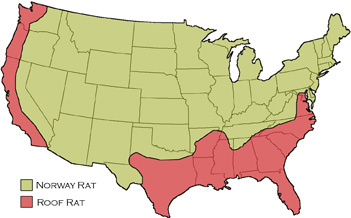 Distribution of Rats in the U.S.
Burrows provides rats with shelter and food storage as well as safe, thermoregulated nest sites. Rats use their burrows to escape from perceived threats in the surrounding environment - for example, rats will retreat to their burrows following a sudden, loud noise or while fleeing an intruder. Burrowing can therefore be described as a "pre-encounter defensive behavior," as opposed to a "post-encounter defensive behavior," such as flight, freezing, or avoidance of a threatening stimulus. 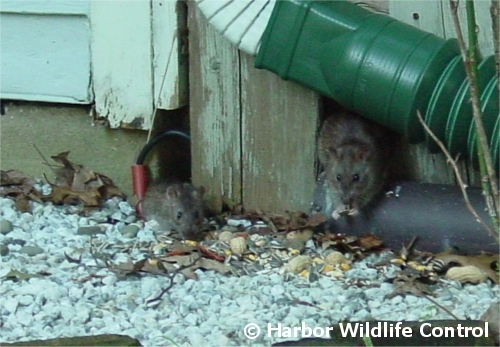 Similar to other rodents, brown rats may carry a number of pathogens which can result in disease, including Weil's disease, rat bite fever, cryptosporidiosis, Viral hemorrhagic fever (VHF), Q fever and hantavirus pulmonary syndrome. In the United Kingdom, brown rats are an important reservoir for Coxiella burnetii, the bacteria that causes Q fever, with seroprevalence for the bacteria found to be as high as 53% in some wild populations. This species can also serve as a reservoir for Toxoplasma gondii, the parasite that causes toxoplasmosis, though the disease usually spreads from rats to humans when domestic cats feed on infected brown rats. The parasite has a long history with the brown rat, and there are indications that the parasite has evolved to alter an infected rat's perception to cat predation, making it more susceptible to predation and increasing the likelihood of transmission. The House Mouse (Mus musculus) is a small rodent, a mouse, one of the most numerous species of the genus Mus. As a wild animal the house mouse mainly lives associated with humans, causing damage to crops and stored food. The house mouse has been domesticated as the pet or fancy mouse, and as the laboratory mouse which is one of the most important model organisms in biology and medicine It is by far the most commonly used genetically altered laboratory mammal. House mice have an adult body length (nose to base of tail) of 3.0–3.9 in and a tail length of 2.0–3.9 in. The weight is typically 0.4–0.9 oz. They vary in colour from white to grey, and light brown to black. They have short hair and a light belly. The ears and tail have little hair. The hind feet are short compared to Apodemus mice, only 0.59–0.75 in long; the normal gait is a run with a stride of about 1.8 in, though they can jump up to 18 in. The droppings are blackish, about 0.12 in long, and have a strong musty smell. The voice is a high-pitched squeak. House mice can transmit diseases, and can damage food and food packaging. Some of the diseases the house mouse carries can be deadly. Here are some of the diseases the house mouse can transmit: Murine typhus, Rickettsialpox, Tularemia, and the Bubonic plague. 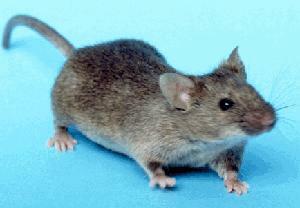 These mice can be very dangerous to people if they contaminate anything in their houses, especially food. It is also possible for wild house mice to transmit rabies, therefore a wild house mouse should never be handled. They can also cause substantial damage when feeding on grain. It is thought that house mice were the primary reason for the taming of the domestic cat. Various mousetraps have been developed to catch mice. Generally, rats are more harmful to humans than mice.